This simple Indian dish of boiled potatoes is just that...simple. Still, I would not say this is anywhere close to being true Indian fare. 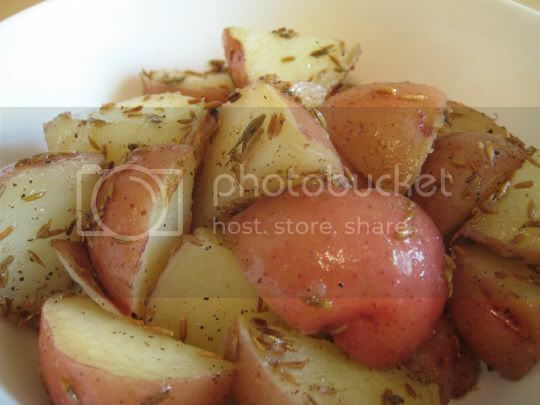 I'm used to saucy, curried potatoes when I think of this cuisine, not potatoes so simply spiced and flavored. There is the perfect amount of salt and pepper, and the cumin seeds add a different twist that one wouldn't usually expect with potatoes. There was also a sort of sweetness present, maybe from the type of potatoes (baby red), maybe from the cumin seeds? Anyway, this is fine for a side dish, but you'd better have something else to go with it that's nice and flavorful to excite your taste buds.